Anesthesiology is the practice of medicine concerned with providing pain relief and protecting wellbeing and safety of the patient before, during and after the medical, surgical and obstetrical procedures. Anesthesiology and Clinical Science Research is an open access and peer reviewed international journal published by Allied Academies, UK. The main objective of the journal is to provide a platform for the international scholars, academicians, practitioners and researchers to share the contemporary thoughts and innovations in the field of Anesthesiology. It strives to promote new insights and discoveries in the field that can improve regular practice of anesthesia. 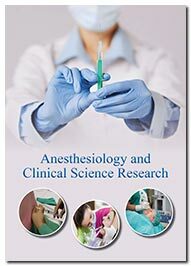 The journal publishes basic and advanced experimental, translational and clinical research of high scientific quality in all the fields of Anesthesiology including Local anesthesia, General anesthesia, Obstetric anesthesia, Modern trends, Critical care and trauma medicine, Intensive care, Anesthesia management, Responses to anesthesia, Anesthetics administration, Anesthetics efficacy, Pre-operative counseling, Mechanisms of action, Postoperative pain management, Preoperative care and evaluation, Post-anesthesia care, Anesthesia risk, Emergency medicine, Anesthetics and pharmacology, Emerging technologies, Tools and equipment. The journal has a strong clinical focus and is aimed at clinicians providing an online forum for publishing the highest quality articles in the area of anesthesiology. It welcomes articles of current interest from all areas of clinical science research like Clinical Trial Management System, Clinical biostatistics, Clinical research ethics, clinical trial etc. The journal publishes original research papers, review papers, case studies, short communications etc. Special Issues devoted to important topics of anesthesiology will be published occasionally. The journal’s editorial board members with strong expertise in the field initially screen scholarly works submitted by authors whether or not to send for full peer review. The journal follows double blinded peer review process where our expert reviewers provide comments on the quality and content of the submitted articles. The journal’s editorial board considers the peer reviewers’ reports and makes the final decision to accept or reject the manuscript for publication.